A simply beautiful cookbook, What To Bake & How To Bake It would make the perfect gift for the budding baker in your life. 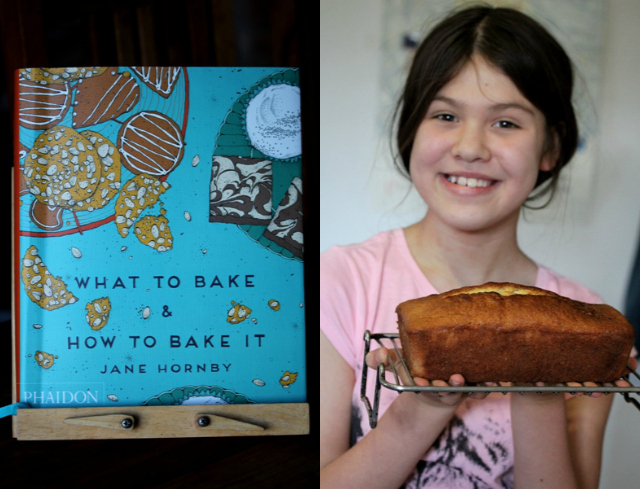 My nine-year-old daughter baked the buttermilk pound cake at the weekend with hardly any help from me, and we can confirm the recipes are very easy to follow with useful (and stylish) step-by-step photography. The cake was ruddy tasty too. It’s written by Jane Hornby, a columnist for GoodFood magazine and regular contributor to Guardian Cook, bbc.co.uk/food and Waitrose Kitchen, who specialises in achievable, delicious recipes for home cooks and beginners. There are 50 beautifully illustrated recipes broken down into four chapters: Simple Family Baking, Morning Coffee & Afternoon Tea, Special Bakes, and Desserts & After Dinner. Each recipe is accompanied by plenty of stunning images of both the process and end result, and fool-proof, clearly written instructions. Recipes include cakes, cupcakes, muffins and slices, biscuits, breads and puddings. Following my daughter’s success with the pound cake, we’ve got our eye on the chocolate fudge layer cake next. 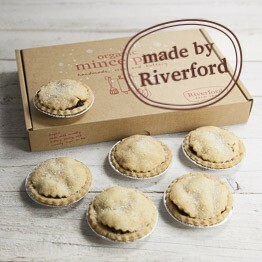 These organic mince pies from Riverford are said to be legendary and I can see why. They are absolutely stuffed full of sumptuous mincemeat and the crumbly shortcrust pastry is to die-for. They look pretty rustic too, so you could even pass them off as homemade. Not that I’d ever do such a thing of course, but just saying. They’re not the cheapest, but they are worth every penny. I absolutely love this selection of ‘fandom sampler’ teas from Adagio. And if you’re a fan of the Harry Potter books or films and love a good cuppa, then I daresay you’d love them too. 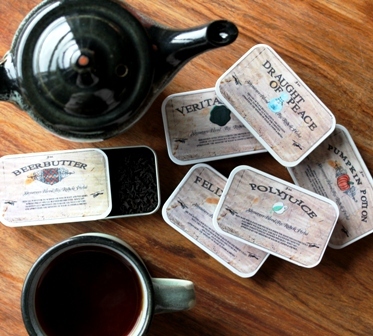 These Magic Potions signature blends are inspired by potions and drinks featured in the stories, such as Veritaserum and Draught of Peace. My personal favourite is the Beerbutter (based, of course, on Butter Beer), which is a black tea, flavoured with caramel and vanilla. Polyjuice is also really rather yummy; a black tea and rooibos blend, with notes of cinnamon, ginger, cardamom, coconut, chocolate, lemon grass, cloves and orange. Warming and refreshing. You can also win a gift box of Spice Jubilee teas from Adagio in this month’s Spice Trail challenge. Budgens is taking on the upmarket supermarkets this Christmas with its premium range. Their Discover the Taste Christmas range is available in 180 independently owned retail stores across the UK and featuring the very best of British food and flavours from around the world. I can particularly recommend the Scottish smoked salmon and the cute mini mince pies, just the right size for eating in a single bite. I know, I tried. Budgens’ gorgonzola is absolutely delicious and will definitely be making an appearance on my Christmas cheese board, while the hummus topped with pesto and parmesan is my favourite discovery of all. I anticipate consuming many pots of this over the festive period. Blessed are the cheesemakers. So say the good people at Cheeky Monkey who sent me one of their Mozzarella & Ricotta cheesemaking kits recently to try out. 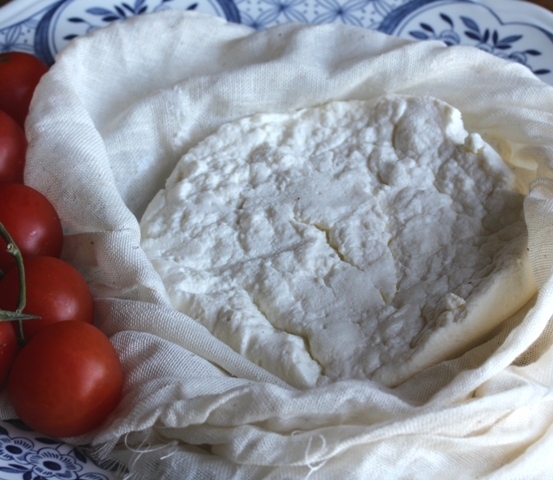 And this is the ricotta I successfully made – I really didn’t realise just how easy it is to make your own cheese. It was delicious too. I’ve used it in bulgar wheat salads and also enjoyed it for breakfast with fruit and lots of honey. If you know a cheese-fiend, how about giving them one of these brilliant kits containing all they need to make their very own simple cheese? If you’re looking for ideas for nibbles at your Christmas parties and get-togethers, do give these new deli-style snacks from Walkers a try. We’re rather addicted to these posh crisps here at Chez Bangers. 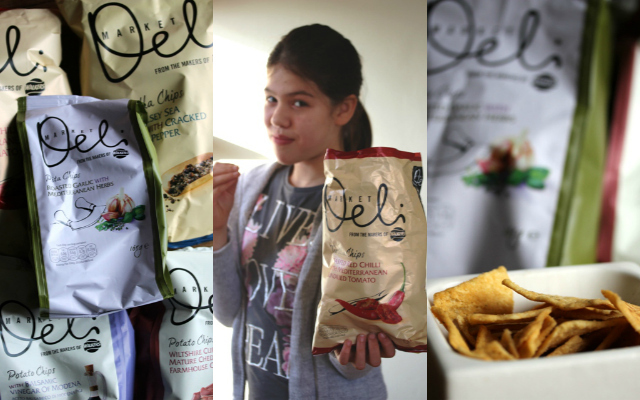 Available nationwide, the new Market Deli range features pita and tortilla chips, as well as the classic potato crisp, and in eight different flavours. My family’s favourites are the Wiltshire cured ham, mature Cheddar and farmhouse chutney flavour crisps, the roasted garlic with Mediterranean herbs flavour pita chips, and best of all are the Anglesey sea salt with cracked black pepper tortilla chips – be warned, they are insanely moreish. Another suggestion for party nibbles next, this time from good old Tesco. 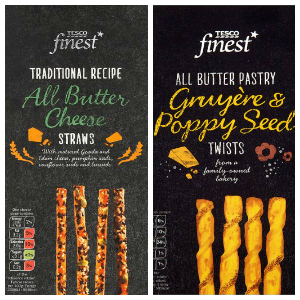 My family adore their All Butter Cheese Straws and their Gruyère & Poppy Seed Twists, tasty either on their own or served with dips. The Cheese Straws are made from layered puff pastry topped with Dutch Gouda and Edam cheese, topped with linseed, sunflower seeds and pumpkin seeds, while the twists are made with Gruyère and topped with crunchy poppy seeds – the name pretty much gives it away, I suppose. Be sure to pick up a few boxes of these tasty morsels, as they’re likely to disappear fast. M&S is always a good place to head for tempting puddings and desserts and they’ve got some real crackers on the shelves for Christmas. These two are absolutely gorgeous and come highly recommended. If you like salted caramel, you’ll love their Salted Caramel Brownie Slices. There’s a rich chocolate brownie base, covered with a creamy ganache, chocolate and salted caramel mousse, and topped off with a crisp Belgian chocolate. And how about a Belgian Chocolate Jaffa Sphere? 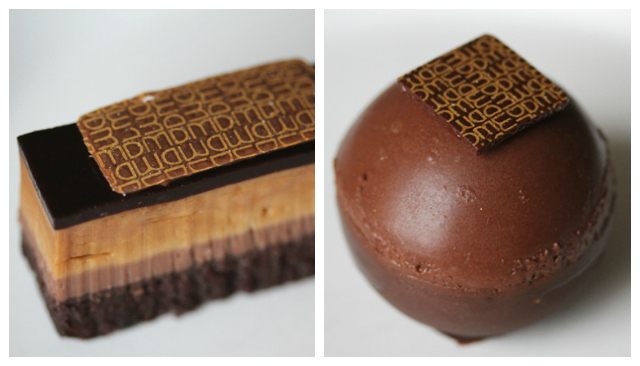 The dark Belgian chocolate shell is filled with a fluffy chocolate mousse and boasts a zingy orange marmalade centre. Just delicious. Children and chocolate. They go together like bangers and mash. So how about giving this lovely chocolate lollipop kit from Chocolate at Home as a gift this Christmas to the little people in your life? My girls had an absolute ball making their own chocolate lollipops, complete with cute bumblebee transfers, and enjoyed gobbling them afterwards even more. The Chocolate at Home kit comes complete with 250g of delicious Belgian chocolate buttons, 2 strips of bumblebee transfers, eight lollipop sticks, bags and ties. They also provide ideas for further decorations, such as marshmallows or crushed cookies. My oldest daughter sprinkled hers with freeze-dried strawberry pieces, which worked really well. 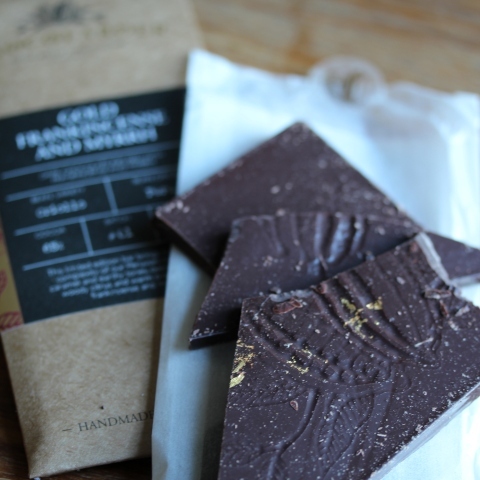 If you are a chocolate connoisseur, you will appreciate this wonderful special edition chocolate from Chocolarder, the artisan chocolatiers based in Cornwall. This limited edition Gold, Frankincense & Myrhh bar brings together rich Peruvian dark chocolate with the woody citrus and warm orange of frankincense and myrrh. What’s more, it’s decorated with glorious flecks of edible gold leaf for extra festivity. A definite must-have for serious chocoholics this Christmas. 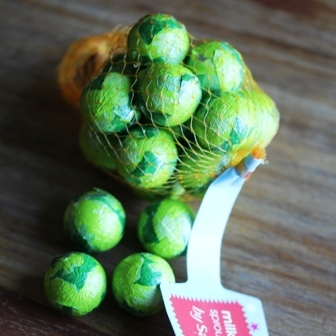 At the other end of the chocolate spectrum are these cute Milk Chocolate Sprouts from Sainsbury’s. OK, so the chocolate might not be the best you’ve ever tasted but my girls aren’t all that fussy and thought these were a bit of a giggle. A fun stocking filler. Disclosure: I was sent complimentary product samples from M&S, Cheeky Monkey, Chocolarder, Chocolate at Home, Walkers, Budgens, Phaidon and Adagio Teas for review purposes. I receive plenty more that don’t get a thumbs up, and therefore don’t make it onto the blog. No money exchanged hands and all opinions expressed are my own. 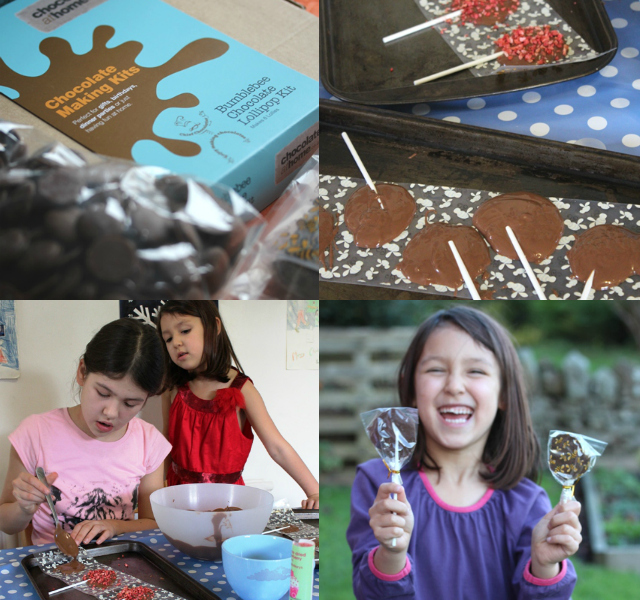 The chocolate lollipops do look fun and I’ll be checking those out for my children! And the cheese-making kit looks like a great reasonably priced gift for a foodie friend.